Locust Pose requires a warm, supple spine and frontal plane. After any back bending sequence, it is important that you release the spine with some gentle twists. Try this brief flow to encourage more openness in your body during this pose. Come to a tabletop position and take numerous rounds of Cat-Cow to loosen and warm your spine. Lean forward to Plank pose and hold for 5 breaths to increase core ignition (feel free to use your knees). Lower slowly to the ground for Sphinx Pose hold for 3 breaths, and then rest for 1 breath. Repeat 3 times. Slide back to Childs Pose and walk your hands over to the right for 3 breaths and then to the left for 3 breaths. Make your way to Downward Dog to lengthen your back muscles and open your spine then curl forward to plank and again slowly lower to your mat. With arms by your sides pushing into the ground, squeeze your thighs together and lift your legs in one piece for half locust. Hold for 3 breaths then rest for 1 breath. Repeat 3 times. Slide back to Child's Pose and come up to Downward Facing Dog to stretch out, then walk your hands to the back of your mat for Ragdoll or an engaged forward fold. Keep your knees soft and uncurl to standing in Mountain Pose. Bring your hands to your heart and twist gently to the right, then to the left. Make your way to Downward Dog and uncurl slowly into plank before lowering back down to the ground. Take Locust Pose and hold for 3 breaths then rest for 1 breath. Repeat 3 times. After this, just rest on your belly rocking your hips side to side to release the back bends, then slide back to Child's Pose to lengthen out. 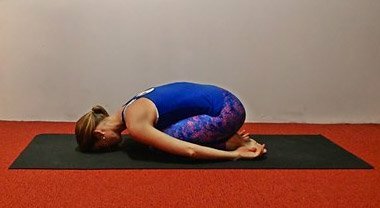 Come to a tabletop position and take Thread The Needle Pose for 5 breaths on both sides. End in a long Child's Pose hold with your arms outstretched.